EURO is gaining and losing power due to the data released by the government such as the unemployment rate, the index growth, 10-year German government bonds yield and the manufacturing PMI in Germany. On the other side, USD is facing falls considering the decline of new orders for factory goods. As the result, EURUSD may move above the weekly pivot point at 1.13260 and climb the ascendant channel. 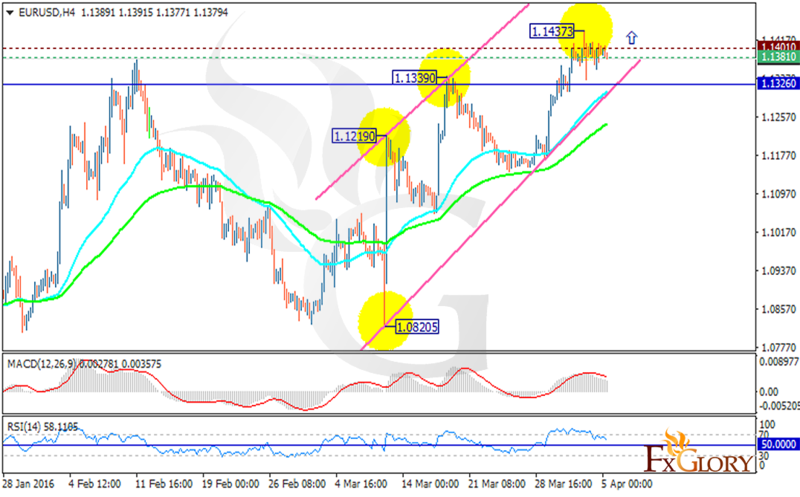 The support resides at 1.13810 with resistance at 1.14010. The EMA of 50 is located above the EMA of 100. From the beginning of March this pair is capturing new highs starting with 1.1219 then 1.13390 followed by 1.14373 and leaving only one low at 1.08205. There is a slight chance that today it leaves another new high. The MACD indicator is in positive territory confirming the price growth with the RSI staying above the 50 level. The resistance level breakout at 1.14010 will smooth the way for further rise. Buyers can target 1.1550 level.